News and information for the Burbank Tournament of Roses Association, Burbank, California. The Burbank Tournament of Roses Association has done it again. 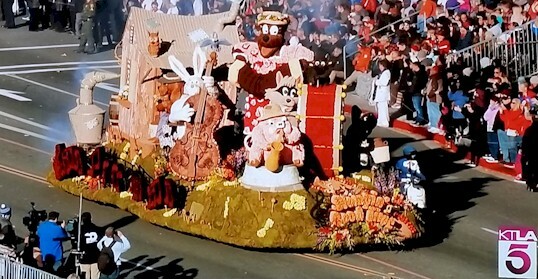 Their 2019 float entry, an all volunteer effort, includes a group of moonshining animals playing, singing and having a "Stompin Good Time". This creates a new dimension in float creativity. Congratulations to Steve Edward and his entire crew for taking chances and winning, the award for "Most Outstanding Animation" once again. For as many years as I can remember, the Burbank Tournament of Roses Association has created, built and displayed remarkable floats in the Tournament of Roses Parade. One of few cities in Southern California that use an all volunteer, non profit association to build a float entry in the most famous parade in the world. When it comes to volunteer efforts in the arts and education, Burbank residents and association volunteers continue with a great tradition. After growing up in the Burbank of the 1950s and 1960s, I traveled far from home. Upon returning to Southern California, Burbank drew me back to its fold. Somehow, I found myself watching the Burbank Rose Parade Float roll from the Float Barn and into the light of day. Rather than marveling at hundreds of floats created by and for large corporations, I stood and stared at one whimsical, beautiful creation covered with flowers, rushes and seeds. In a world that sometimes feels all to artificial, each new Burbank Float is a wonder of nature to me. The Burbank Tournament of Roses 2019 float on KTLA-5, New Year's Day 2019. Olive Avenue leads to the Burbank Float Barn, but you have to know how to find it. Here is a hint. The Float Barn is very near the Burbank Water & Power main facility..
Interstate 5 (The Golden State Freeway) rolls by almost right outside the Burbank Tournament of Roses Float Barn. Burbank Float proudly presents a webcam streaming live from the Burbank Tournament of Roses Float Barn. Click HERE to visit our Home Page and view the webcam. Copyright © 2016 BurbankFloat.com. All rights reserved. Design by James McGillis.